It is true that businesses today cannot solely depend upon conventional marketing methods, and they need to navigate through the scarcely explored world of digital marketing. and talk about their solutions. This is one constrain that has been constant since the time began! Believe it or not getting an adequate budget is one of the biggest issues that marketer faces, across the globe. Your Return on Investment (ROI) is the savior here which can be used upfront to request a higher budget. Businesses that can calculate and present a higher ROI are more like to get a budget hike. Also, effective inbound marketing strategies do play a vital role in producing better results but on the contrary, It is a time taking process to execute and to obtain results. Remember, overspending and loss of revenue occur only when there is improper or NO budget planning. 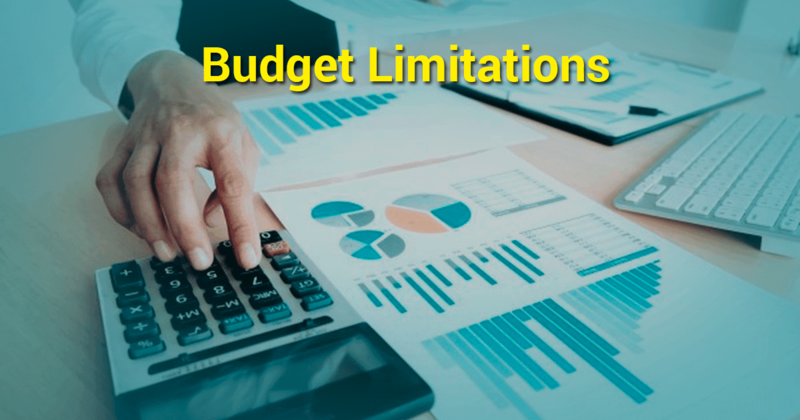 Outlining flexible budgets, of different verticals, may help in organizing and prioritizing your tasks and helps in avoiding hidden costs. must be aligned with the company’s vision and then prioritized. have been their top most challenge. 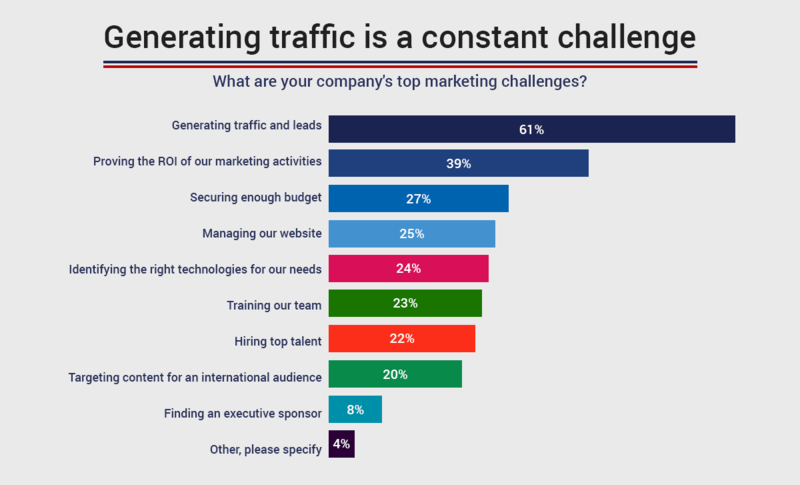 Irrespective of the billions of websites present on the internet, generating adequate traffic and demand for content has always been the biggest challenge. that provides value to the buyer through that value research process, which will not only generate just traffic but qualified leads too. Use content marketing to establish a strong connection with user, by becoming a subject matter expert (SME) on topics or pain points that your services are solving i.e. regular blog posts, news and tips regarding the industry. Also producing guides allows you to capture data which can later on be nurtured. 84% marketers use social media to drive traffic and acquire leads.These are great platforms for remarketing campaigns because most of your website visitors will see the ad and this opportunity can be used to provide an incentive to send them back to your sales funnel. Optimizing your website for local SEO allows the business to tap the surrounding community and helps you get users when they’re needed most. A conventional method of marketing i.e. 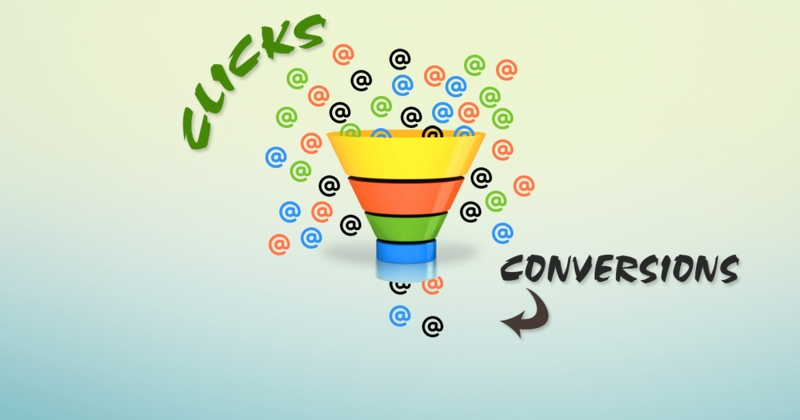 segmented email marketing can double up as a very powerful tool when trying to acquire or up sell existing customers. So, it is very important to transform your email marketing strategy by customizing your message to target specific segments of your customer database. You may be spending a huge section of your budget on poorly performing channels targeting the incorrect audience. Your design and copy may not be the appropriate tool to attract your audience, or may they are just not in-sync. 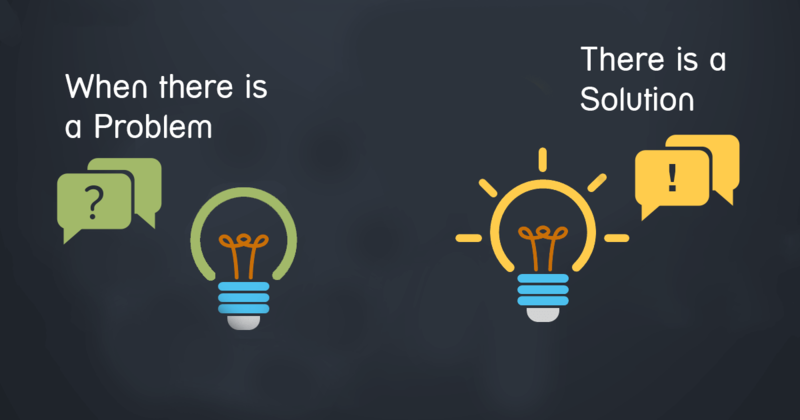 It would be advisable to get a better idea of the problem and create content that would address the exact problem. It is also quite possible that your audience is funneled through mobile and on the contrary, your website is not mobile responsive and hence you are losing them right on the 1st or 2nd page. Try implementing a mobile responsive design with relevant content to make them stay. Landing pages are serious trouble makers for your headache of low conversion. A bad or an ineffective landing page can seriously turn away even your highly-interested potential customers. Designing a landing page is tough topic in itself and the interface should always be user friendly, simple, pleasing, fast and with relevant content. Customers are generally very impatient so when it comes to website loading and user navigation, more is the time they spend and more likely they are to convert into leads. The top most priority of every business is to stay ahead of their competition and to look for new ways to market themselves in a new revolutionary way. 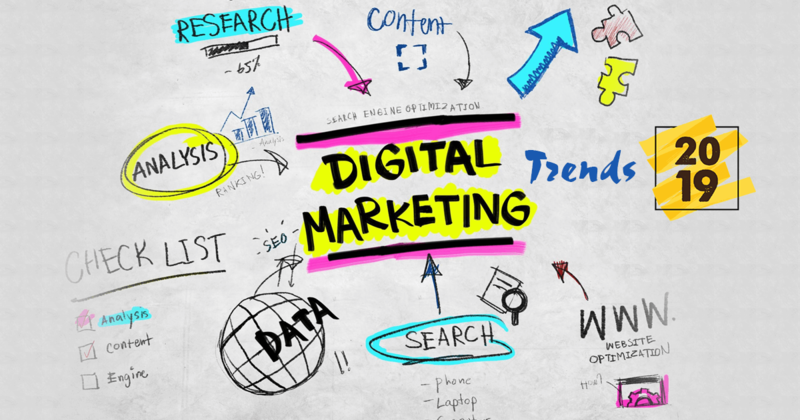 The simple urge is to gain a competitive edge, attract higher website traffic, new leads, more customers and all this can be done by staying up-to-date on the latest trends in digital marketing. Blogs – are definitely the best ways to stay updated on industry trends. Keeping an eye on them brings you closer to the most happening trends. LinkedIn – An online professional networking platform and a great place to connect with digital marketing experts as well as groups. You can use LinkedIn pulse to receive the relevant news/trends only, which you need to by simply setting up with the topics, influencers and publications that finds your interest. Social Media – Twitter / Facebook are one of the best ways to stay updated with the upcoming digital marketing trends. Don’t forget to follow the industry leaders to stay ahead of the competition. Google Alerts – Setting up Google Alerts will fetch you regular email updates for ongoing and upcoming trends. The results can later on be bifurcated according to the area of interest, region, occurrence, and relevance. Challenges are inevitable and are bound to appear, no matter where you are and whatever you do! Digital marketing too not being an exception. 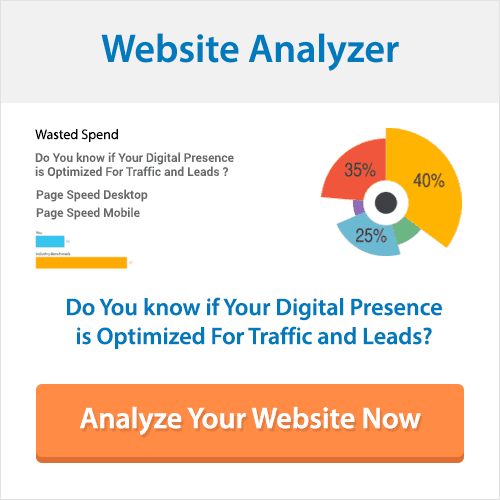 Are you also facing any of these commonly occurring digital marketing problems? Then this read will allow you to focus on their solutions. Did we miss anything? Want us to cover some more topics; do mention it in the comments section below.